This chunky little book is stunning! Choose one of several colors of handmade paper with a gorgeous mum pattern to create the cover. The open back features a striking “starburst” binding which coordinates perfectly with the cover p aper. This journal is 4 3/4”x 5 3/4” and contains 84 heavy weight, unlined cream color pages bound with Irish wax linen. Your class fee includes all the materials that you will need to create one book. 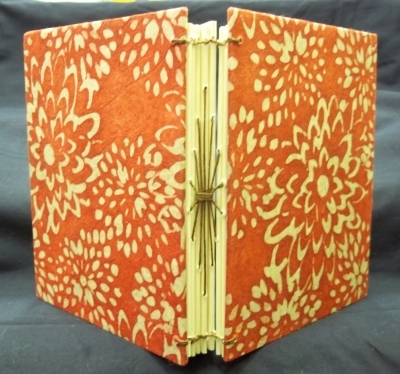 Jan is a graduate of Hollanders School of Book and Paper Arts in Ann Arbor, MI and is a bookbinding master. Bring: pencil, ruler, bone folder, awl, scissors, 1” foam or flat brush for gluing, an old wash rag to use for gluing, and a transparent 12” ruler. Helpful if you have: a paperback book at least 1” thick to use as a punching cradle (using it for this purpose will break the spine, so bring a book that can be “abused”). Please follow the “Stampaway” link to the right to register!